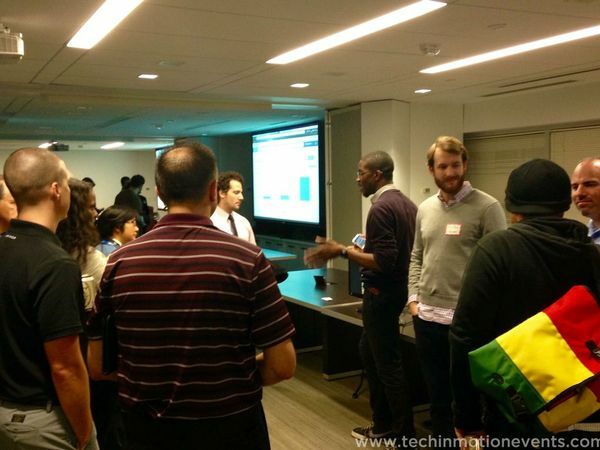 Last fall, members of the Tech in Motion community from around the Washington, DC metropolitan area attended the DC chapter’s Demos & Drinks meetup event at the Advisory Board Company. Emphasizing a relaxed atmosphere, Tech in Motion’s demos events are styled similarly to a job fair; attendees can circulate freely from one company’s table to the next while enjoying drinks and good company. Interested in speaking or being a demo company at Tech in Motion? Contact us. The demos event took place at the Advisory Board Company, a modern-style office located in the heart of Washington. Members of Tech in Motion DC’s community, including entrepreneurs, developers, product and project managers, systems and network engineers, designers, and marketers all began arriving at 6:00 pm; attendees began filing into the board room suite that allowed the demo companies to set up their presentations and interact with the 100+ engaged attendees comfortably. Refreshments flowed abundantly at a bar located in the back of the room. The demo companies, DataRPM, Streamup, EventKloud, and Vouched, received an extremely enthusiastic response from the DC tech community and shed light on their respective products’ impact on their industry. DataRPM is an award-winning, industry pioneer in Smart Machine Analytics for Big Data. DataRPM’s demo showed how their product enables Automatic Data Modeling from disparate data sources using cognitive algorithms. Streamup is a live video community, whose product allows viewers to watch thousands of real-time channels and talk to other viewers or create their own channel and broadcast from there. Their demo detailed how users can establish their own streaming channel as well as discover new channels of interest to subscribe to. Pipevine’s Vouched app geared their demo towards professionals who are business development oriented. This tool allows users to crowdsource their strongest professional traits, using existing LinkedIn connections. As an event marketing software, EventKloud’s demo was interesting to those who are business analytics oriented and find themselves in the marketing and sales space. This customizable software provides personalized content, encourages engagement & utilizes data-driven audience intelligence to improve the marketing for event campaigns. 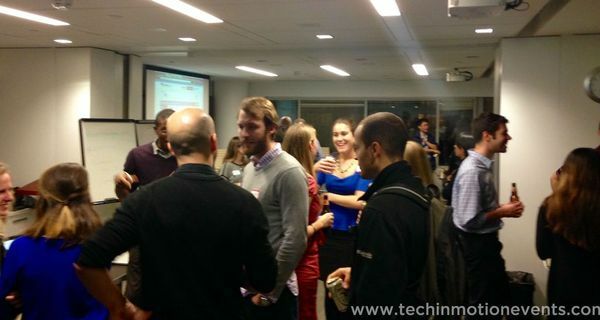 “It was a really awesome, engaging event,” one DC techie remarked. 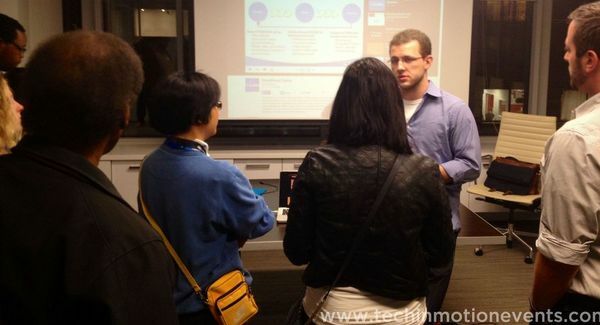 To attend a Tech in Motion event near you, check out the list of events here. At one of it’s biggest events to date, the D.C. chapter of Tech in Motion gathered entrepreneurs and tech aficionados alike at the infamous startup incubator, 1776, located in the heart of downtown D.C. The event that brought these groups all together? It was none other than Tech in Motion’s “Made in D.C.” panel discussion, featuring some top influencers and prominent thought-leaders from the local tech community. As the attendees began to arrive, there was no shortage of eager and inquisitive individuals milling about the tables of Tech in Motion’s featured sponsors, Microsoft and Alarm.com. After a fun demo by Microsoft’s representative, Lisa Abdilova, on the ways to bring your travel plans to life via Bing, OneDrive, Outlook.com and Internet Explore, the panel kicked off. The panelists for the evening consisted of Ghafran Abbas, the Chief Architect at SocialRadar; Chuck Ghoorah, EVP at Cvent; Ian Lotinsky, VP of Engineering at LearnZillion; and Evan Burfield, a Co-Founder at 1776. The discussion was moderated by the Co-founder and COO of Nexercise, Greg Coleman. The panel detailed the trials, tribulations and successes from their personal experiences of fostering a company from the ground up in D.C., with a specific emphasis placed on tech companies. The panel kicked things off with the question, “What does D.C. have to offer compared to other tech hubs like Silicon Valley, New York or San Francisco?” The panelists unanimously agreed that D.C. is uniquely and actively looking for solutions to real, substantial quality-of-life issues in such areas as education and healthcare. The startups in D.C. focus on issues that matter, rather than coming up with the next social app like “YO” – and what’s more, the community is proud of that. The conversation then shifted to address common challenges that startups encounter when looking to get a foothold in the District. Evan stated that the biggest challenge he sees showing up time and time again for any startup in the community “is how fragmented D.C. traditionally is and how to overcome that”. This fragmentation has proved a big barrier to overcome, with the result that the tech communities local to Virginia, D.C., and Maryland rarely cross paths. Individuals are very supportive of their own communities but show a surprising reluctance to venture out into each other’s spaces and connect; however, as Chuck stated, the willingness to help on another out within the community is astounding. When prompted further, Ian stated that D.C. has not “reoriented all of the available assets in D.C. to focus around this [tech] community,” which continues to perpetuate this lack of resource awareness that prevents startups from thriving. Ghafran then navigated the discussion towards a more technical focus, expressing that the main challenge facing the tech community and startups in D.C. is a series of disconnects. Ghafran stated that the challenges he’d seen as a developer are two-fold. Many developers find it difficult to connect with non-developers and, in part as a result of this gap, many companies experience difficulty in finding the tech talent they require. Along a similar vein, one of the biggest tech challenges that Ian experienced in his career was finding entrepreneurial engineers and teaching them company culture or vice versa. The dialogue wrapped up with a nod towards what the future holds for the D.C. tech community. There were two trends that the panelists agreed upon as being a part of DC’s future. The first was a movement of startups geared towards topics unique to D.C. Ghafran stated that D.C.’s future lay “in healthcare, education, and government. It’s what’s unique to D.C. and [we] will see a huge engine of startups come and focus on that in the next ten years”. The second trend was broader in nature and expanded to include not only D.C., but also the country as a whole. Currently, Silicon Valley is commonly viewed as THE place to be for technology. However, Evan argued that “while Silicon Valley has been viewed as this tech mecca, there will be a diffusion of this to different cities,” which will transition the tech community away from this mecca-mentality. The dialogue then wrapped up with a brief Q&A section, closing out the event with a tangible buzz of excitement and inspiration in the air. Check back in next month for a recap of the next D.C. event – or just join the DC chapter to be a part of it. Tech in Motion is a production of Motion Recruitment Partners © 2019 Motion Recruitment Partners LLC. All rights reserved.